We have just reached our first anniversary of creating a plastic-free household. During the past year we concentrated mainly on unpackaged food, cleaning materials, toiletries and plastic-free clothing. We have collected every scrap of plastic packaging that we have accidentally, or otherwise, brought into the house. This has amounted to roughly one large bagful of plastic packaging from medical supplies, items that we bought which had hidden plastic packaging inside, presents that were given to us, and also from items that seemed unavoidable. 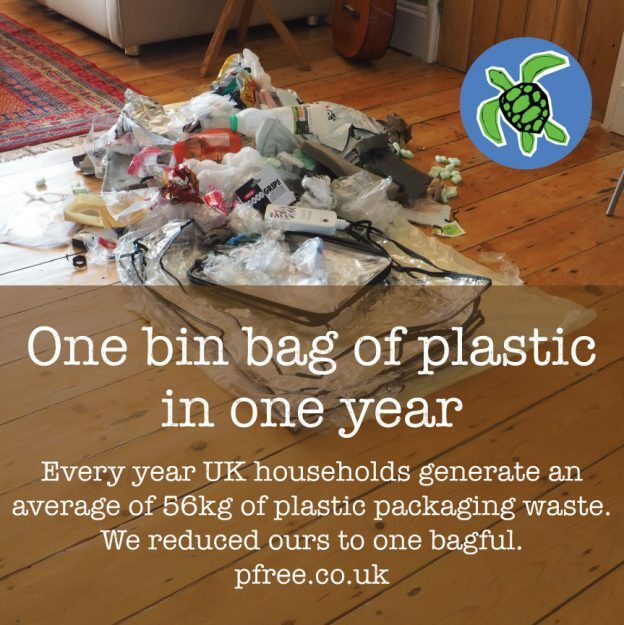 Considering that UK households produce an average of 56kg of plastic packaging waste a year, our one bag weighing no more than a couple of pounds represents a great achievement. In reality, our single-use plastic footprint is much larger than the household figures measured by Defra and in our case, it is bigger than the single bagful collected over the course of a year. Much of our plastic waste is created outside the home, for example in the workplace, at school, in restaurants, at the petrol station, at the hairdressers, at the gym, and by pursuing hobbies and other pastimes that take us outside the home. In the supply chain of the goods I conscientiously buy ‘unpackaged’, there are unknown quantities of plastic packaging. We are not the only ones in the dark: at a recent talk given by Tesco on food waste, which I attended in Oxford, I learned that all of the large supermarket retailers “currently don’t understand or know enough” about the plastic packaging waste in their supply chains. This means that the plastic packaging that each of us is ultimately responsible for is not just in our bins at home. Over this past year I have read report after report, attended events, talked to many people and the story is the same everywhere. Most people think there is too much plastic in their lives and that we should recycle more and develop new materials to replace plastic. However, few talk about the one solution that is surely staring us in the face. The one solution that could prevent further environmental crises and help restore local communities is ethical consumption. Ethical consumption means that you choose only what you need, what has been paid for fairly, what has been made to last, and what has been produced sustainably without hurting people, animals or the earth. I might not be a shining example of the perfect ethical consumer yet, but I am immensely interested in becoming one. It seems to be one of the few things in life that is actually within my power! Plastics_Market_Situation_Report_2016 by UK based WRAP, the world leaders in helping organisations achieve greater resource efficiency. Between 2010 and 2015 in England alone, WRAP initiatives reduced greenhouse gas emissions by nearly 50 million tonnes (Mt), which is equivalent to the annual carbon dioxide emissions of Portugal. How did I calculate 56kg of plastic packaging per UK household? I used the most up-to-date figures provided in the two reports above which are for 2014 (new data is collected every two years, so the data for 2016 should be available soon). I applied this to the total number of households in the UK in 2014 as provided by the Office for National Statistics. This entry was posted in Bathroom and Cosmetics, Cleaning, Clothing, Food shopping, General, Getting started, Health, In the kitchen, On the go, Pets, Recycling and tagged ethical consumption, plastic-free-living, unpackaged on May 5, 2017 by admin. Dear Claudi, congratulations to your ‘1 year plastic-free cycle’ with the whole family. This is a huge task and I can’t imagine the many hours you have given to organising, visiting, researching etc. Ever since I am reading your very interesting blog I see plastic packaging, waste and rubbish in towns and parks or around fastfood restaurants in overwhelming quantities. So, I thank you for your awareness and enormous energy you have given to the task of informing us all. Well done – one bag for a whole year is a fantastic achievement. We are working hard to reduce our plastic waste too but are way off from reducing it that much so far. Brilliant work! My family and I are doing the same… it’s a long journey but we’re in for the entire ride. Week by week we keep on reducing. I have today decided to try to drastically reduce our single use plastics during June for the Marine Conservation Society #plasticchallenge. Your blog has been a wonderful, inspiring read. It’s also great that you are so close – I live in Bristol, so I can check out some of the local things that you’ve mentioned. I’m going to see if Wild Sage & Co are at the next BS5 Market in St George and replace my Tresemé with a shampoo bar! Good morning. I have just had the pleasure of reading your inspirational post in the Warbler about your great work. Amazing and eye opening! We live just across the valley in Ruscombe. Maybe we can make Whiteshill and Ruscombe an exemplar eco-zone? Fabulous – the amount of waste everyone creates is terrifying yet so many people are unaware of the problem … or think it is some-one else who is making the problem OR someone else needs to sort it out. We all need to take responsibility for our actions and work together to find solutions. When manufacturers realise there is a market for change we stand a chance of moving forward is a positive way. I run a monthly blog linky called Going Green and I would love it if you would consider linking up to the July one which opens on July 3rd. Just wanted to say how wonderful your blog is, I’ve been sharing it everywhere this January on Social Media because it is such a good guide to getting started on reducing plastic and is so well researched. This really is a zeitgeist moment on plastic; as councils around England buckle down finally to recycling, people are becoming so much more aware of how much plastic they buy and throw away. The brilliant reports and campaigns on marine pollution have put this subject up to the top of the news agenda as well. When I shared your post and said I was going to try to follow your recommendations, I got a huge response from friends and neighbours and when I went into work I found someone had put up a copy of one of your articles on the kitchen wall calling on workmates to follow through on reducing plastic. So thank you, your blog is a great resource. Many thanks for sharing this info, very useful!